The Leaders Dilemma: Who am I and why would they follow me? Leadership is a risk, a challenge, it’s hard and painful, but also an extremely rewarding endeavour. Effective and lasting change requires leaders who can overcome their own personal frailties and insecurities and keep stepping up for the greater good. – Who am I to lead these people? – Why would they want to follow me anyway? 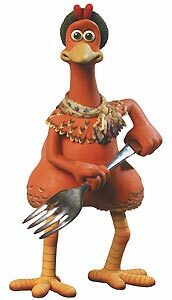 My favourite scene in the film Chicken Run is when the chicken-leader, Ginger, addresses the other chickens in the henhouse about the plan to escape the oppression of the evil Mr and Mrs Tweedy. Ginger gives a passionate oration, firing them up, casting a vision of life outside the Tweedy henhouse. She then goes outside, leaving the cheering hens and collapses into tears asking – who am I to lead these chickens and why would they follow me? The story of Moses in the ancient Judeo-Christian scriptures is one of a leader who continuously struggled with the challenges of leadership. He also asked himself these two questions. – Who am I to appear before the Pharaoh? – Who am I to lead the people out of Israel? Assignment – There is an important job to be done and right-here-right-now I’m the one who is required to do it. There are frequent stories throughout history of reluctant leaders like Moses, who overcame their own insecurities to take up the responsibility of leadership. Great leaders choose to do this because their people deserve better and the responsibility to lead is so great they just can’t shake it off.